June 1, 1948: Arshile Gorky's wife has a birthday party. Among the guests at Agnes' 27th birthday were her and Gorky's neighbours - the writer Malcolm Cowley and his wife, Yves and Kay Tanguy, Peter Blume and his wife and Alexander and Louisa Calder. (MS355) Agnes' mother arrived with Agnes' and Gorky's children, Maro and Natasha, who she had been looking after in Virginia. According to Gorky biographer Matthew Spender who later married Maro, Gorky told Agnes [nicknamed "Mougouch"] that he didn't want to see his children because it would be too painful. Another Gorky biographer, Hayden Herrera whose father later married Gorky's wife, wrote about the same incident without mentioning that it was at Gorky's request that the children were removed. Although Hayden Herrera comments that "For years she [Agnes] had fended off Matta's flirtatiousness. Now his naughty-boy behavior began to attract her" in her section about Matta's visit in her biography of Gorky, Herrera notes one page later in the same book that there was nothing in Agnes' June 7th diary entry "to indicate any amorous relationship with Matta." Agnes' diary entry for June 7th reveals that rather than being enamoured with Matta, she didn't trust him. June 17, 1948: Agnes ["Mougouch"] has a secret rendezvous with Matta. Agnes ["Mougouch"] later recalled that she "bolted on June 17, the morning after this horrid experience with Julien Levy and Gorky." (HH585) Gorky's art dealer, Julien Levy, had been visiting the Gorkys at the Glass House and had brought with him a bottle of whiskey. Gorky was not normally a drinker (and certainly not as much of a drinker as Julien) but on this occasion both men got drunk. After dinner they discussed what an artist's wife should be and compared an artist's wife to, among other things, a horse pulling a cart driven by the artist. The conversation made her so angry that she "left the room in tears" and the next day packed a suitcase and left. "I packed a tiny suitcase. I told Gorky I was going away, but I didn't tell him where. I had a local girl who used to baby-sit for the children. I got her to come early and to leave when the children went to bed. I said to Gorky, 'I'm going away for a couple of days.' I said I'd be back on Sunday. After I left I rang up Matta. It was perhaps the worst thing I ever did, but I did it. The affair with Matta ruined my life in one zip. But if I'd stayed, Gorky's violence would probably have driven me away anyhow, as he got worse and worse. 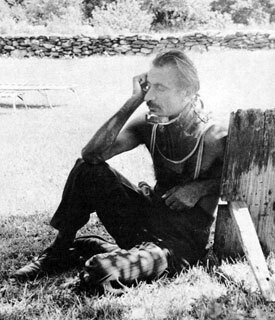 Agnes first heard of Gorky's accident from Kay (Sage) Tanguy who lived near the Gorkys in Connecticut. Kay rang Agnes in Virginia to tell her what happened and Agnes flew home. Matta met her at the airport. When Mougouch arrived at the hospital she was shocked by what she saw. In addition to his neck being broken Gorky's painting arm was "semiparalyzed." July 1 - August 25, 1948: Willem de Kooning teaches at Black Mountain. De Kooning got the job through the efforts of a friend he first met when working for the Eastman Brothers - Misha Reznikoff. Reznikoff knew the sculptor Peter Grippe and his wife Florence who ran the Atelier 17 printmaking studios in Greenwich Village. Reznikoff knew that de Kooning needed money and asked the Grippes if there was anything they could do for him. Joseph Albers, who was head of the art department at Black Mountain, was a friend of the Grippes and mentioned to them that he was having problems finding faculty for the summer session. Mark Tobey had agreed to teach painting but became ill and had to cancel the arrangement. Grippe recommended de Kooning for the job, adding that both John Cage and Merce Cunningham who were on the Black Mountain faculty, knew Bill and would vouch for him. After checking with Cage, Albers offered de Kooning the job. He would be paid $200 in salary in addition to room and board and train fare for both Bill and Elaine. De Kooning accepted the offer. Gus Falk later recalled what his class was like. Still in New York, Gorky phoned the Schwabachers who invited him to visit for the weekend but he told them he wanted to return to Sherman. He told Ethel that he was very unhappy and that his marriage was at an end. Ethel became concerned and rang Mina Metzger who, like Ethel, had been a student of Gorky's and had remained in contact with him. Mina had apparently already spoken to Dr. Weiss and Gorky was to see a psychiatrist in three days, after the weekend. She suggested that someone accompany Gorky back to Connecticut if he insisted on going. Meanwhile, Agnes was attending an auction with her parents in Virginia. (MS367) She apparently rang Jeanne numerous times but was unable to get through. When she did finally reach her, Jeanne told her that Gorky had been wandering the streets. Agnes ["Mougouch"] wrote to the Schwabachers from her parents farm in Virginia where she had taken the children - Crooked Run Farm. Gorky's mental condition is serious, has been for several years and I have been dreadfully wong in trying to pretend otherwise... At the moment he is in no shape to make any decisions regarding the children nor do I know what we will be able to do with the future, even as to where we should live. I have written our tenant in the studio explaining the necessity of Gorky having it back, if for no other reason to try to establish a sense of continuity in his tormented world & later when I see how things go I must find a job & make a home for the girls... I think in a few days or a week I will take them up to Castine until I can come to some understanding with Gorky... I never conceived of life as easy & that if we failed it was because I had failed - a fatal case of inflation alas, for this thing is far beyond me now, and all his friends with all their warmth & affection can only help him if he can help himself. Believe me, my heart has been totally engaged even to the exclusion of my instinctive nature and if I could have I would have spared him this but my love was not strong enough I guess. I shall always be devoted to you & grateful beyond words & thank God I know you love him. Gorky had continued to roam the streets of Greenwich Village after Agnes took the children to Virginia. Noguchi later told de Havenon, 'I heard someone calling. I thought I was dreaming but then I realised it was a real voice. Isaamu, just like our friend. Noguchi drove Gorky back to Sherman, accompanied by Wilfredo Lam and his wife Helena, whom Gorky had met a year or so previously. In Sherman they rang Saul Schary who promised to bring Gorky some groceries and to keep on eye on him. The evening of July 20, 1948: Saul Schary visits Arshile Gorky. The morning of July 21, 1948: Saul Schary visits Gorky again. The previous evening Schary had left his glasses at Gorky's home. Having said good-bye to Schary, Gorky called Mougouch again... He told her he was going to take his bath. After that he would 'free her and free himself.' When she talks about these days, Mougouch's voice becomes constricted, almost as if her vocal cords cannot give sound to this memory: 'He told me, 'I'm going to kill myself. I'm going to hang myself.' I said, 'Don't. I'll come back. I am coming back.' He said, 'Don't come back. I've read your diary and I'm going to free you.' He said it quite nicely.' She repeated her offer to return to the Glass House, but Gorky abruptly hung up. Mougouch tried to call Gorky back, but he didn't answer. Late morning/afternoon July 21, 1948: Arshile Gorky commits suicide. Sometime after Schary left Gorky's neighbours, the Blumes and the Cowleys went to the Glass House to look for Gorky. Peter Blume had been there earlier but had not found Gorky home and had rung Saul Schary to ask if he knew where he was. Kay Sage had meanwhile rung Muriel Cowley to ask if she could check on Gorky, telling her "Don't go alone." (HH611) After finding nobody there the Cowleys had gone over to the Blumes to find out if they knew anything. The two couples returned to the house to look for Gorky. July 22, 1948: Arshile Gorky's obituary appears in The New York Times. Gorky's obituary repeated various false claims that he had made during his life in regard to his past. He was not the cousin of Maxim Gorky and he had not been born in Russia. After Gorky's death, five biographies were published about him. The first was Arshile Gorky by his ex-student and friend Ethel Schwabacher. Schwabacher's book, published in 1957, included a preface by Lloyd Goodrich and an introduction by Meyer Schapiro. In 1962 Harold Rosenberg brought out Arshile Gorky: The Man, the Time, the Idea. In 1998 Black Angel: A Life of Arshile Gorky by the Armenian writer Nouritza Matossian was published. A year later Matthew Spender's biography of the artist, From a High Place: A Life of Arshile Gorky came out. The latest biography, Arshile Gorky: His Life and Work by Hayden Herrera was published in 2003. Both Spender and Herrera had links to the Gorky family. Spender was married to Gorky's daughter Maro and Herrera's father was married to Gorky's wife, Agnes, after Gorky's death. In addition, Karlen Mooradian, the son of Gorky's sister Vartoosh, also published translations of Gorky's letters. While researching her Gorky biography, Nouritza Matossian discovered that many of the letters were fakes. Matossian was unable to ask Karlen about the letters because he died in 1990 - a year before his mother, Gorky's sister Vartoosh. While researching his biography on Gorky, Matthew Spender, confirmed Matossian's suspicions about some of the letters that Karlen had published. "Karlen Mooradian was the only son of Vartoosh, Gorky's younger sister. It was Karlen who had translated and published all of Gorky's letters to his mother, the largest single source of information about Gorky's thoughts on art. On the walls of the tiny apartment in Chicago where he and his mother lived their entire lives hung photos of himself in poses exactly like the poses that Gorky had assumed at the same age. Karlen never married. His whole adult life was spent in the shadow of his uncle. In a piece on Arshile Gorky's memorial show - and it was a very little piece indeed - it was mentioned that I was one of his influences. Now that is plain silly. When, about fifteen years ago, I walked into Arshile's studio for the first time, the atmosphere was so beautiful that I got a little dizzy and when I came to, I was bright enough to take the hint immediately. If the bookkeepers think it necessary continuously to make sure of where things and people come from, well then, I come from 36 Union Square [Gorky's studio]. It is incredible to me that other people live there now. I am glad that it is about impossible to get away from his powerful influence. As long as I keep it with myself I'll be doing all right. Sweet Arshile, bless your dear heart. September 1948: Jackson Pollock drawing in Partisan Review. A company called County Homes ran a series of ads on the inside cover of Partisan Review. The series included work by both Pollock and Gottlieb. Pollock's drawing titled Drawing appeared in their advert that ran in the September 1948 issue. Under the reproduction of the drawing the company noted, "We asked Jackson Pollock to draw this picture to help tell PR readers what County Homes is doing about housing." (SG185) The drawing was a fully abstract work which could not possibly "help tell PR readers" anything about County Homes or housing. Pollock started seeing Dr. Edwin Heller, a general practitioner who had opened a clinic in East Hampton in 1947. The period of sobriety would last until the autumn of 1950. (JP190) It would be his longest period of sobriety as an adult. Clyfford Still was originally to be one of the teachers [at The Subjects of the Artist school]. We had arranged it that each of us would teach one day so that, say Baziotes would teach on Mondays; Rothko Tuesdays; David, Wednesdays; I would teach Thursdays; and Still, Fridays. At the last moment, for reasons I've never known, Still dropped out and went back to California. So there was a blank day and to fill that blank day we began to invite other artists - de Kooning, Reinhardt, Harry Holtzman - I don't know who all - to come and instead of teaching to give a lecture in the evening. We were very anxious that the school not be doctrinaire, that those of us who were teaching be regarded as individuals, and that the students be regarded as individuals. Those Friday evenings, as they came to be called, became the magnet, the center, for everybody in New York who was interested in the avant garde to come to. Originally it was just for the school. Then people would call up and say, "Can we come, too?" And pretty soon we were renting a couple of hundred chairs and so on. We were so poor then that the pay for whoever gave the lecture was to be taken to dinner and given a bottle of his favorite liquor. In those days we all drank seventy-five cent sherry. If he wanted a bottle of Scotch or whatever it was we got it for him, and seven dollars was like seven hundred dollars now. Then that whole tradition went on and became the famous Club. But that was pure chance." [Note: According to the Frey Norris Gallery's Wolfgang Paalen chronology, in 1948 Paalen spent "November and December in New York with Motherwell in East Hampton to discuss the foundation of a new art school with Rothko and Clifford Still." The school had already opened by that time. October 1948: Philip Guston travels to Italy. Only a few drawings from his trip remain. Although Guston painted sporadically during the trip, he did do a lot of drawings in Rome but didn't keep them. A few drawings that he did on Ischia (where he had gone "to escape the oppression of the masters") exist. He also visited to Spain and France. Rothko's mother had suffered an extended illness and her death had been expected. Robert Motherwell recalled, "The death of his mother is the only personal thing he [Rothko] talked to me about at length. He became obsessed over whether or not to go back to Portland." (RO265) Rothko stayed in New York. October 11, 1948: Life clarifies art. Participants included Aldous Huxley, Georges Duthuit, Meyer Schapiro, James Johnson Sweeney, James Thrall Soby, Sir Leigh Ashton, Clement Greenberg and Francis Henry Taylor. October 25, 1948: André Breton excommunicates Matta. November 2, 1948: Harry Truman is re-elected President. c. 1948/49: Willem de Kooning meets Mary Abbott. December 1948: "The Sublime is Now" by Barnett Newman appears in The Tiger's Eye.